Miguel Paolo Mendoza's nature is always to serve and help other people first. He is compassionate and generous with his friends and tries to help them in small ways whenever he can. 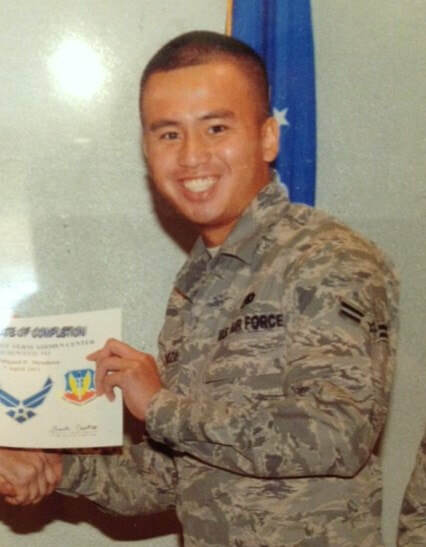 It's no wonder that after finishing two years in college, he decided to join the Air Force to serve his country. He retired in 2017 because his former Superior recommended him to an assignment in South Korea, where he is now stationed. Miguel is very independent--which is why he decided to join the service--but in our minds, he didn’t want to burden us; he wanted us to be proud of him. Miguel was raised and schooled in Lakewood, graduating from Lakewood High School in 2008. During his high school years, he was active in volunteering with the American Red Cross, serving as the blood drive coordinator, donating blood and helping his teacher, Mr. Holm, in every step of the process. He received a two-year scholarship from the American Red Cross. While in college, Miguel worked at the Wetzel's Pretzels at the Lakewood Mall. We, his parents and his brother and sister, currently live in Lakewood.